A man has appeared in court charged with murdering his baby daughter. 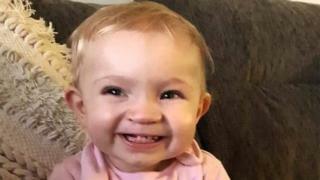 Fourteen-month-old Hollie Ashurst died on Friday from head injuries, a day after medics were called to her home in Fleming Court, Shevington, Wigan. At Wigan Magistrates' Court, 32-year-old Daniel Ashurst was remanded in custody until 7 March when he will appear at Manchester Crown Court. Hollie was described by her mother, who has asked not to be named, as a "bright, smiley, happy little girl". The "little ray of sunshine" had just started to crawl, her family said. "Hollie was my dream come true," added her mother. "She brightened everyone's day and was an inspiration and never unhappy. "Fly high my princess with your other loved ones and sweet dreams my baby girl, I will always love you." Greater Manchester Police was called to Fleming Court at 14:00 GMT on Thursday by medics who said they were taking a toddler to hospital. A post-mortem confirmed Hollie died of head injuries.